The message of peace and amity, love and goodwill for the followers of Islam and humanity at large given by Hazrat Imam Hussain (RA) through the supreme sacrifice made at Karbala is unique and undying. His whole conduct in response to religious duty and to meet the challenge of the forces of evil characterises his high sense of human values. It was the month of Rajab, 60 AH, that Amir Moaviya died and Yazid assumed power. He claimed already to be the heir-apparent for some time earlier in the days of his father, who was the ruler of the realm. Little wonder that immediately upon ascending the throne, he began his campaign of ensuring loyalty of those whom he could easily count to be dissidents. Accordingly, he sent a letter to the Governor of Madinah, Walid bin Atba, to obtain the oath of fealty (baet) from various local personalities, particularly Imam Hussain (RA), the only descendant and surviving grandson of the Holy Prophet of Islam (PBUH). The Imam, no doubt, offered condolence over the death of Yazid’s father, but, in reply to the main point, he, while maintaining due composure and remarkable sense of courtesy, disdained from acceptance, despite the coercive posture of Marwan, who was present and had suggested an instantaneous assassination. The Imam scolded Marwan and told Walid his viewpoint in the mildest of terms. Imam Hussain (RA), being a free citizen, was in no way bound to carry out any and every behest. Having discovered the intention of the new ruler, he felt that the consequence of his open conflict, which was becoming inevitable, as it goes without saying, would be bloodshed in Madinah - the resting place of his grandfather. He, therefore, decided to leave the sanctuary along with his family on the third day of the incident after visiting the grave of his grandfather. Prudence and expediency accounted for Imam’s departure without loss of time for otherwise, who could thus abruptly abandon his hearth and home, losing the rightful conveniences of a settled life. In the small caravan that the Imam took to Makkah were his dependents and near and dear ones. He carried no soldiers with him. This also showed his intentions of peace and tranquillity in the land. Peace does not mean acceptance of a wrong as a bargain for personal security. A desire for it and an adherence to the ideals for maintaining the same do not mean that one should betray one’s conscience or surrender other high moral attributes such as religious injunctions, valued principles of life and fundamentals of human freedom in various norms and forms. Imam Hussain (RA) knew the distinction and he made the right choice when he refused an immoral offer and demand; and, by abiding by the dictates of spiritual imperatives and social proprieties, paid with his own blood and that of his brave companions, who also earned their place in heaven by their infinite sufferings and matchless sacrifices. This preference for the course adopted was well-reasoned, the justification for which is found in well-authenticated sources of recorded facts. Professor Abdullah Yusuf Ali, the celebrated translator and commentator of the Holy Quran, writing in “Progressive Islam Pamphlet No. 7”, throws some light on the character of Yazid in these words: “He cared nothing for the most sacred ideals of the people. He was not even interested in the ordinary business of administration. His passion was hunting and he sought power for self-gratification. The discipline and self-abnegation, the strong faith and earnest endeavour, the freedom and sense of social equality that had been the motive forces of Islam, were divorced from power. The throne at Damascus had become a worldly throne based on the most selfish ideas of personal and family aggrandisement, instead of a spiritual office, with a sense of God-given responsibility. The decay of morals spread among the people” (Imam Hussain and his martyrdom, pg. 22-3). Confrontation: This tendency of Yazid served to deepen the crisis and a confrontation became simply inevitable. His lieutenants stampeded the showdown and accounted for the tragedy of Karbala within a short time of the ascendance to the seat of power by the unworthy Omayyad prince. The grave and alarming situation here was entirely different because the destroyer of life and liberty of one who was the custodian of Islamic tenets was bent upon humiliating and, in the alternative, killing the Imam and those who stood by him through thick and thin till the bitter end. In the pursuit of peace, Imam Hussain (RA) arrived in Madinah. People welcomed him and paid their homage. Some leading personalities, like Abdullah ibn Zubair, offered their unstinted support should he stands up as their leader. Other luminaries, like Abdullah ibn Jafar and Abdullah ibn Abbas, advised him not to leave Makkah, but the Imam proceeded according to his own volition, i.e. neither to scramble for office and spoil for a fight, nor to invite instantaneous mortal danger to himself. He could not refuse attending to the clarion call for help and guidance from the popular leadership in the city of Kufa. Imam Hussain (RA) deserves credit for doing things that were right and righteous. Above all, he did nobody any harm. But if he was not allowed to live in peace even in Makkah, to hold religious discourses for the mitigation of widespread ignorance and enjoy a safe refuge, he could not be blamed for the faults of others. He delivered numerous sermons during the long sojourn from Madinah to Karbala, but there is no word to bespeak any violence, incitement, personal animosity, friction or confrontation. Of course, he yielded neither before Walid, the protégé of Yazid, nor Hur, the platoon commander of the Omayyad forces, sent as an advance guard to obstruct his passage and even capture him by all possible means. The Imam resisted, but did not retaliate. The long march staged through difficult routes and by facing scorching rays of the summer sun interspersed by gusts of dust storms formed part of his mission of peace. After all, it was he who was undergoing all that suffering, and his action could not be for the mere pleasure of it. He broke his journey at various halts along the way to the final destination on the plains of Nainawa. Among the more known places, Zarood, Salbia, Zabala, Qadsia and Sharaf assumed importance for the speech delivered or discourse held that provided the key to determine his purposes, namely preservation of peace and reformation of social and moral conditions, which as an Imam he felt bound to attend to as much as possible and from any nook and corner where his services were clamoured for, the most. In the instant case, it was Iraq that voluntarily asked for his help by sending messengers and letters and with unbroken persistence. Islam itself means peace, and its message is to establish peace on earth. It is another matter that the world has gone astray today whose result is nothing but chaos, confusion and conflict. The great Imam did his duty in the best manner to salvage mankind. What is more that could be expected of him when he refused to fight for worldly power and pelf, which many men die after and know no end to the employment of means for attaining their ends, however improper and unjustified. He achieved the immortal glory of martyrdom. 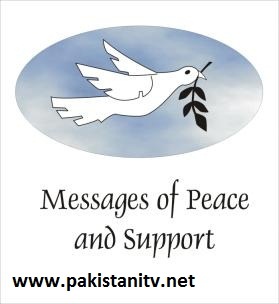 1 Response to "The message of peace by S.Murtaza hussain"
i look peace every where but not possible in pakistan.what you say?